This show is just releasing quality episodes every week. It isn’t easy for shows to be consistently good every week. But so far Kaguya is managing to be great every week. And this episode was no exception. The only real difference might have been that they managed to squeeze in 4 parts to the episode instead of the standard 3 that they’ve been going with thus far. This time we got the cat ears, banned word game, the phone call, and the French conference. I thought they all worked pretty well and made for an episode that kept me laughing for much of the time. Not a huge surprise after last week that they phased out that intro for this episode. You can always feel the passion for this series from the people making it. Instead of that intro they just jumped right into the fun cat ears business. The banned game portion does show how Fujiwara fits right in with this group. She is far smarter than Shirogane or Kaguya might give her credit for. Not that she can’t be straight up goofy and miss out on what those two are really fighting about. But I do love how she played both of them in this game. The emotional manipulation against Kaguya was top notch and she even beat Shirogane at the same time. Her bluff was so strong it made Kaguya try to comfort her and it fired up Shirogane enough that he self-destructed. It is a good lesson for Shirogane. He may have been playing his own game within the game, but he wasn’t the only one. 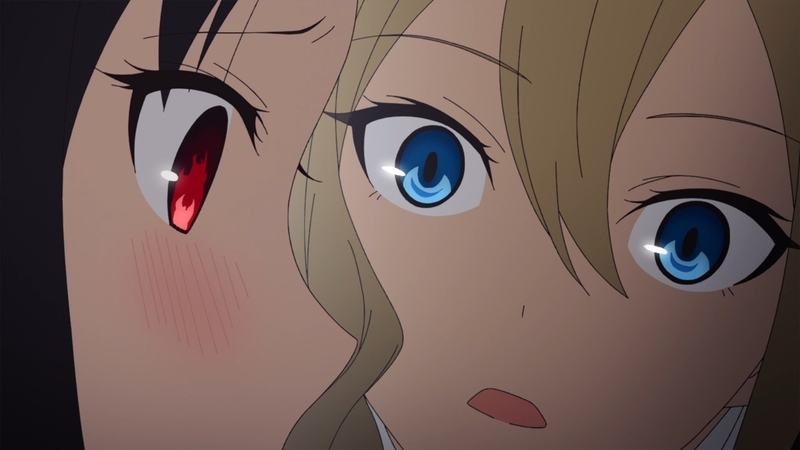 One thing I really love from this episode is how synchronized Shirogane and Kaguya can be. Both of them were just losing their minds in that cat ears portion. It was a great way to make use of the inner monologues both characters often use in this show. We had both of them trying to hide their excitement which resulted in rather extreme facial expressions. It just killed me when he was speaking quietly and yet downright screaming “cute” in his mind. But it worked both ways. 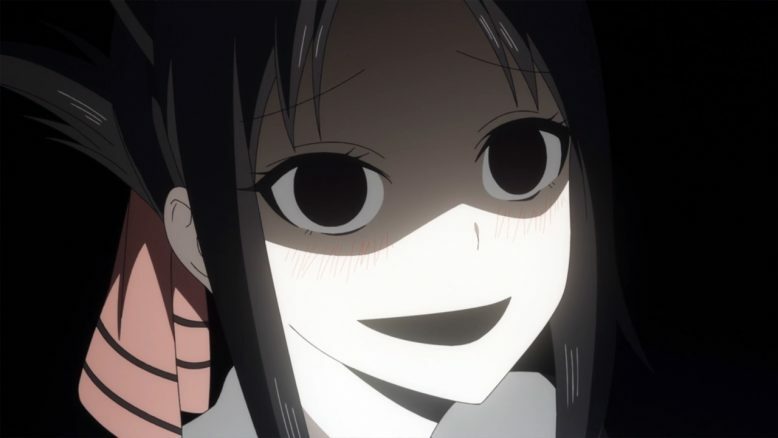 Kaguya had to literally bite her tongue to try and erase her own huge smile. Neither could do more than limit it to a tense scowl and a smirk. The magic of those ears just pushed these two to the brink. 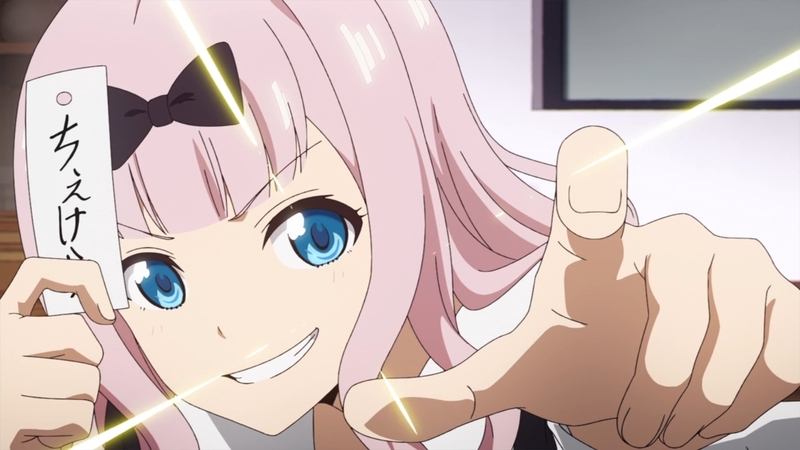 It’s too bad that Fujiwara broke first since they’d have gotten a great picture out of it. The phone call portion and the aftermath again just shows how they are both lovable idiots at times. They were both ready to race out into that weather to meet up. The only difference was that Kaguya had someone to stop her from going. Huge props to Hayasaka for giving Kaguya the push she needed. I can only imagine her exasperation watching Kaguya be so dishonest with herself. No wonder she can’t confess if she can’t even admit it to someone close to her. But that does allow her to push Kaguya’s buttons effectively. 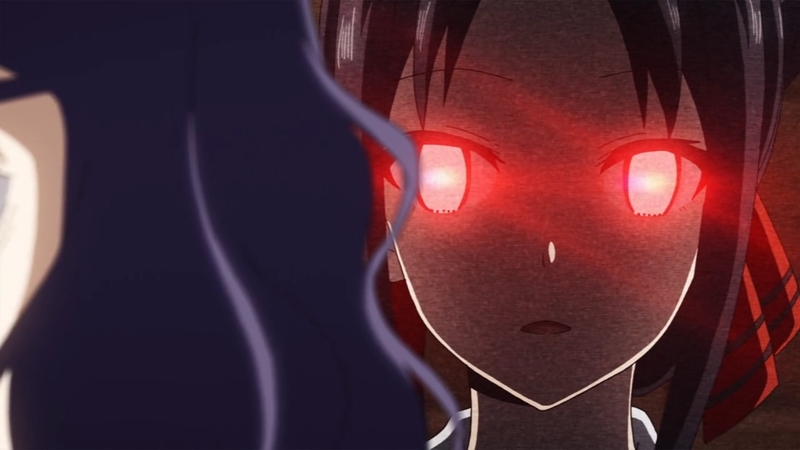 That is one rock solid person though to willingly set off Kaguya’s jealousy mode without breaking a stoic expression. I’m also glad she’s able to just come up with an excuse for Kaguya to call Shirogane and dialing herself before Kaguya could poke holes in her strategy XD. Maybe the best moment when she pushed Kaguya’s buttons though was during that phone call. Just hitting Kaguya where it hurt by reminding her that she was talking to the guy she likes while he isn’t wearing clothes XD. 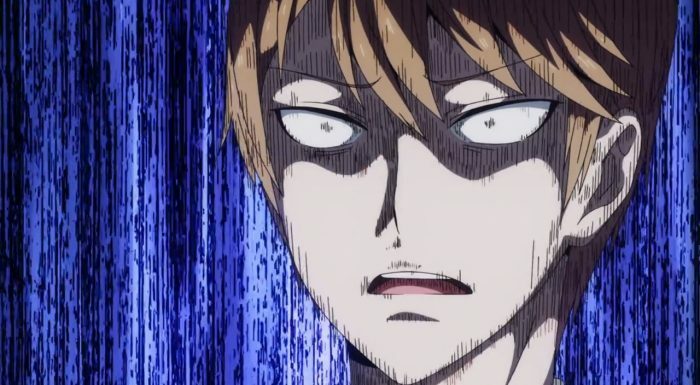 I also give full credit to Miyuki’s father for forcing Kaguya to call Miyuki by his name. Honestly it is just fun watching Kaguya get flustered. It all happening over the phone allowed her expressions to remain natural. No need to turn away or hide from the person in question since they aren’t physically there. Again I’ve got to give credit to the people making this episode. 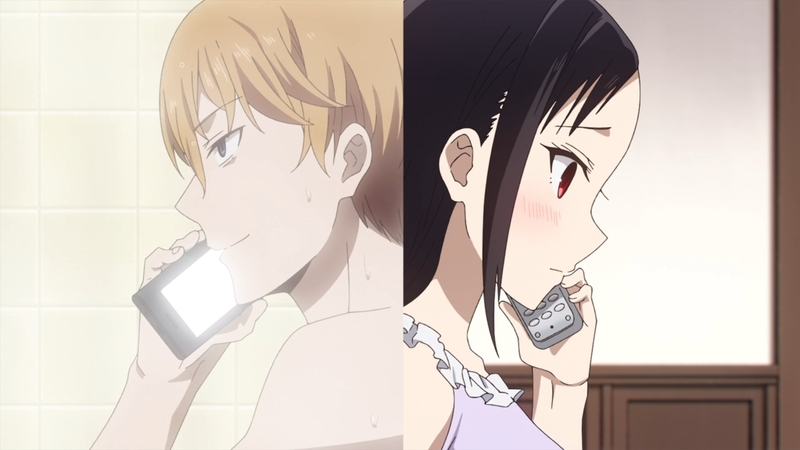 I loved them cutting the music off when Kaguya ended the call only to pick it right back up again when she realized he was trying to say something to her XD! The French portion was also just fun. Honestly I’m not sure if the French was badly pronounced in this episode or if all the mandatory French I had to learn in school has completely been drained from my mind. But I wasn’t following much of what anyone was saying in this part of the episode. A standard for this show is how plans always seem to blow up in the face of the person making them. The Headmaster had his plans to test Shirogane and see if he was able to handle extreme verbal abuse from foreign exchange students. But his plan utterly flopped because Shirogane couldn’t follow a word that was being said. Even if he could tell he was being insulted the damage is minimal without understanding. RIP Betsy. That girl is going to have nightmares for weeks. Plus she’ll probably need to go and dye her hair after it was scared white. Not only was her verbal assault blissfully ignored, but Kaguya probably threatened to annihilate her in the cruelest ways possible. She just straight up snapped. Normally she’d never risk looking bad in front of Shirogane, especially when she was still under the shared misunderstanding that Shirogane could speak French. But she’s certainly the type that can’t hold back when a loved one is insulted. It did allow the episode to end on a nice note. Shirogane said exactly what he needed to. I’m sure he did appreciate that she was angry for his sake. This was just another great episode. I also want to give praise to the narrator for being awesome. The show just wouldn’t work at the same level without that voice hitting over the top levels. “MARRIAGE” indeed. It also appears we are going back with the first ED we saw. It would make sense to leave that as the standard ED. Maybe the plan really is to have the Fujiwara ED to be something we rarely see and make it a special reason for people to buy the show’s first volume. I have no doubt that ending has the ability to move volumes of this show XD. But anyways, this was another good episode. It started with characters screaming “cute” in their minds and ended with these characters straight up being cute.